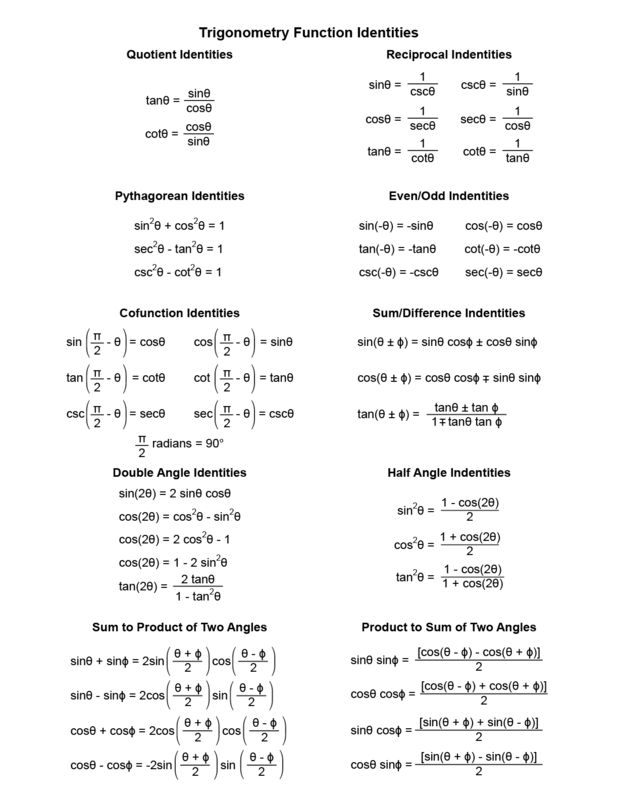 This study sheet has ten groups of trig identities for the basic trigonometry functions. These identities include the reciprocal and co-function relationships between trig functions. There are also half-angle and double angle identities, along with sum and product relationships. This table is an extremely useful thing to keep on hand when working with trig functions. Print a copy and keep it with your textbook today. This cheat sheet is optimized to fit on a single sheet of paper. Download the PDF version to print your own. I’ve corrected the mistake and uploaded a new image and PDF. Thanks for catching that error! Thanks for letting me know about the mistake. I’ve updated the PDF and the image to reflect the correction and a few minor cosmetic tweaks.